We all know that the ocean is a fish-eat-fish world and if you’d like to grow some fins and plunge into that underwater arena, Junglee Games is here to help. 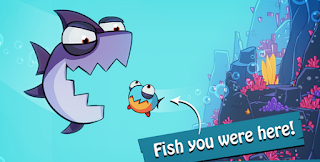 Eat Me is a new mobile multiplayer game that takes players through an exotic underwater world populated by fish that can be cute and tasty or large and hungry. The game supports up to 100 fishes (players) of different sizes and skills. Species range from clown fish and flounder to Humpback Whales and shark. Players start by eating start eating sea weeds to grow bigger and stronger, then move on to hunt and devour other fishes. Larger fish can gobble up smaller prey but the smaller fish also have defenses. They can hide behind stun bombs or drop a load of eggs on their attackers. Eat Me is a free download for Android devices available in the Google Pay Store.